A traditional Ogee style profile, with one of the highest capacity PVC-U domestic rainwater systems on the market. This system incorporates a revolutionary designed moulded water-tight seal and retaining clip pre-fitted for fast user-friendly installation. It is important to remember that because Ogee systems are asymmetrical, fittings such as stopends are handed, and angles can be either internal or external. 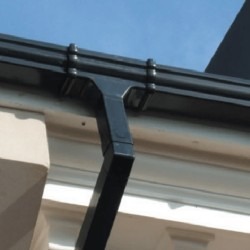 Ogee can be connected to both Half Round and Square guttering using our range of adaptors - these are available on the same page as all of the other Ogee fittings. By using these adaptors you will be able to connect to the guttering of your neighbouring property providing it is either Half Round or Square pattern. As Floplast Ogee is a unique design it is not possible to interchange or connect with other manufacturers' Ogee systems. 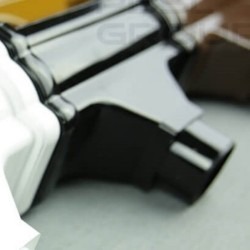 At Professional Building Supplies we supply Ogee in all colours- Black, Brown, White, Caramel and the ever popular Cast Iron Effect. Ogee outlets connect to either circular or square downpipes - it depends upon your personal preference. Most people tend to opt for the circular system which is 68mm in diameter. Downpipes are connected to the drainage system using the D96 adaptor. The Ogee system carries a 10 year guarantee as standard and is manufactured to British Standard by FloPlast at their state of the art premises in Kent. The Cast Iron Effect Ogee system is guaranteed for 20 years. 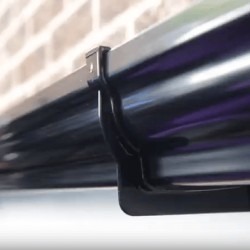 The flow rate of the Ogee system is one of the highest available for any domestic gutter system - higher even than Deepflow and over twice as high as Half Round. As the Ogee system is not symmetrical, fittings such as stopends and stopend outlets are handed either left or right. A left hand stopend fits onto the left hand end of the gutter as you stand in front of it. For the same reason, gutter angles are either external or internal - an external angle is the commonest. The easiest way to differentiate between the two is that if you stand in front of an angle and it turns a corner going away from you, it is external. All gutter seals should be lubricated with silicon lubricant spray prior to insertion of the guttering into the gutter fittings.